This isn't directly related to railroads, but with today being Flag Day, I thought it would be appropriate and a little interesting to look at the flag when Colorado's star was added . It was first used on July 4, 1877, the first Independence Day after Colorado's admission into the Union. The other, more common 38-star version is homely by comparison. Still, I'm proud of the republic for which it stands, one nation, under God. A country with a 200 year-old constitution is a country whose founders knew enough about the human condition to set the proper groundwork for a lasting republic. I pray she not just survives, but thrives in the 21st century with the freedoms I have enjoyed from my youth. In a blatant effort to tie this post directly in with railroads, I researched railroad flags and, although I didn't come up with some obvious, usable images of Old Glory on some trains coming through the Rocky Mountains, I was left with a singular impression that while the railroads weren't explorers, civilization came westward with every tie and rail laid by the railroads. They brought the nation, and its flag, westward, filling the field of blue with stars for a new constellation. This was most certainly true for Colorado. While the Union Pacific entered the Colorado Territory for its transcontinental connection with the Central Pacific, it left the state 8 miles later. This was hardly a help to a territory over 100,000 square miles in area! Denver businessmen had a very real concern that Denver would become a backwater, bypassed by a railroad that was racing over the lower elevations to the north toward the ports of the Pacific. In 1867, nine years before statehood, they organized the Denver Pacific to go north and connect with the UP at Cheyenne. The first train arrived in June, 1870. Not content with merely an umbilical to reach the rest of civilization, Denver boosters worked quickly in 1868 to get the Kansas Pacific extended to Denver by August 1870, two months after the DP. During the construction of the KP, Gen. William Palmer surveyed the route. He fell in love with Colorado and started his own railroad south, in 3-foot narrow gauge. The intention was to reach Mexico City, but eventually turned west by the Atchison, Topeka & Santa Fe, "Palmer's baby road" reached Salt Lake City in March 1883, nearly 14 years after the Union Pacific! By then, Colorado had achieved statehood and Denver was establishing herself as the Queen City of the Plains. 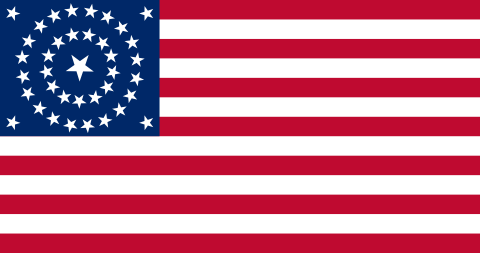 The flag would stay the same until 1890, 13 years after Colorado received her star.